Fueling with real food doesn’t have to be so tricky. Check out these tips, tricks & recipes to fuel your next run with whole foods from Skratch Athlete & Chef, Lentine Alexis. I'm gonna go out on a limb here and say that if you’re reading this, you’ve probably tried eating real, whole foods on your long run and found that it’s not always straightforward. Dean Karnazes may be able to roll up an entire pizza and consume it while still running and keeping pace on a 100-mile race. But what about us regular humans looking to go a little further, get a little faster, and all on real foods? In a nutshell, our digestive tracts are put through a lot of stress when we’re on the move. And, they can be negatively affected when our body temperature rises, when we start to become dehydrated, and just simply because we’re diverting blood flow away from the stomach and into the limbs and core to support our movements. “During exercise,” says Dr. Allen Lim, “the process of digestion and absorption is not principally different than it is at rest. In fact, this process is robust enough to handle most exercise situations, but it can be compromised by prolonged exercise (such as a long trail run,) especially in the heat,” says Lim. What happens when your digestive system is compromised in exercise, you experience what’s called “gastric emptying;” your bowels empty, and never at an opportune time. Gastric emptying is sped up when your body is exercising at a less intense rate, your body temperature is regulated, you’re hydrated, un-stressed, drinking cold beverages, eating low fiber foods and foods with a high moisture content. Which is to say that staying hydrated, avoiding fiber-rich foods, and those without too much moisture is an easy bet. Get to know your bod. Not all bodies are the same. Every body needs something different. Learn YOUR body. This is worthy of some experimentation. Try lots of different easy to carry foods that sound interesting to you. Then, put them to the test. For some, rolling a whole pizza up on the run is a great idea, for others. Your body needs simple carbs (read: simple sugars) to fuel muscles at work. Despite the fact that we’re being trained not to eat simple carbohydrates (like sugar,) this is precisely what your body is asking for when your on the run. We can really only digest so much on the run, so the simpler the food, the better. You can’t aim to replace every calorie you’re burning while running. And really, you can only expect to replace about 20% of those calories. Aim to take in about 60-90 grams of carbohydrates on your long runs (this includes your sports drink and any food you may consume), and choose simple foods that your body prefers and plan real, whole meals on the front and back ends of your run. < 3.5 grams of fiber. Honey sticks or maple syrup candies. Instant hits of sugar, in easy to transport shapes! 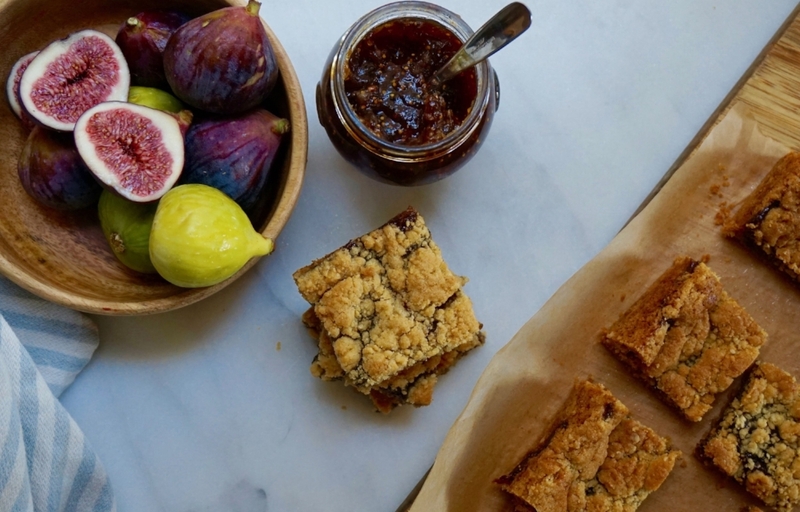 Fig Bars Made with Skratch Cookie Mix - better than the store-bought variety because they contain zero preservatives and only ingredients your body likes to use as energy! In the bowl of a food processor fitted with the blade attachment (or a high powered blender) combine all of the ingredients and blend until smooth. Using a small scoop or a tablespoon, scoop the mixture out and toss it into the coconut and sesame mixture, rolling it to coat and then between your hands to make little balls. Repeat with remaining mixture. Store the balls in an airtight container in the refrigerator for up to two weeks. I go to great lengths to make food from scratch for my long runs; I just love the process of making something craveable for those big days, and just don't love packages! But that's not always possible, so I like to reach for Skratch Labs Matcha Green Tea & Lemon Energy Chews or Miso & Ginger Energy Bars in a pinch! Lentine Alexis is a curious, classically trained chef and former pro athlete. I use my bicycle, raw life and travel experiences and organic ingredients to inspire athletes and everyone to explore, connect and expand their human experiences through food. Follow her on Instagram @lentinealexis.